Babymouse is our favorite mouse in this house. My daughter reads every book in the series she can get her hands on. She's read the copies she owns about 50 times each. She loves Babymouse and so do I. For the uninformed, Babymouse is a graphic novel series featuring a elementary school aged mouse and her friends. Babymouse has a big imagination and spends most of her time daydreaming which gets her into all kinds of trouble. 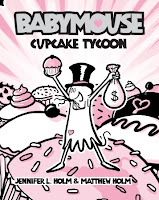 In Cupcake Tycoon, Babymouse has an mishap resulting in total destruction of the school library. The school has a fundraiser to restock the shelves. The students are going to sell cupcakes! And there's a big prize for the kid who sells the most. This is right up Babymouse's alley. But there's one problem: Felicia Furrypaws. For awhile Babymouse loses sight of the reason for selling cupcakes in her attempt to outdo Felicia. My daughter grabbed this book first before I had a chance to look at it. Judging from the giggles, she enjoyed it. Once I got it from her sticky hands and read it, I too giggled. Maybe not as much but yes it was fun. 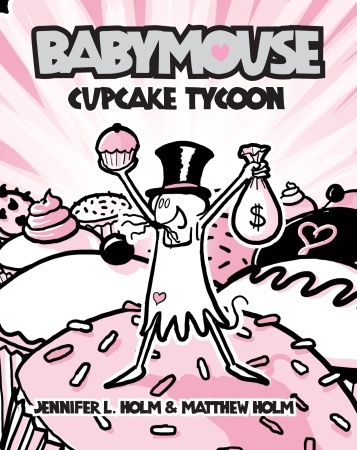 Babymouse uses a lot of pop culture references and most of them went right over her head.Will most 8 year olds know who Donald Trump is? Hmm, I'm not sure. Now the references to Rumpelstiltskin are classic and (I hope) most kids will know who he is. Cupcake Tycoon is entertaining with a message about competitiveness. The black and pink illustrations make this series stand out. That might put off boys but if they get past that they'll laugh out loud at Babymouse's antics. It's great for readers wanting to move from picture books to chapter books. I'm thinking about Xmas gifts already -- is this book/series too young for a 9 year-old avid reader? Or should I save it for the 4 year old who is going to be an avid reader? 4 might be a little young. Fun! Rocketboy and I read Babymouse: Monster Mash (orange illustrations, far more acceptable for a refined boy such as Rocketboy. Cute, cute, cute! Would definitely read more. Babymouse sounds adorable and like the only kind of mouse I'd want in my house.